Marjolein's earliest memory is when, as just a toddler, she would lie in the grass outside her family's home near Utrecht, The Netherlands, breathing in the sights, sounds, and smells of the natural world around her. Little did her mother know that when she lifted little Marjolein from her baby carriage and placed her into the hands of nature, she was placing nature into the hands of Marjolein. As a little girl, Marjolein collected and treasured simple items from nature – pinecones, seeds, and flowers. As soon as she was able to hold a pencil and paintbrush, she began to lovingly capture the beauty of nature in her sketches and paintings. "It was my way of holding forever the impression I loved so much in nature," she says. Marjolein continued to pursue those impressions as she grew and developed her talent as an artist, ultimately attending the Academy of Arts in Arnhem, The Netherlands. Shortly after completing her studies there, her work came to be publicly recognized when she was asked to illustrate a one-page feature for the popular Dutch women's weekly Libelle. A Hallmark designer discovered Marjolein's artwork while on a trip to Holland in the early 1990s, initiating a relationship that has spanned more than 10 years. Today, stationery, greeting cards, home décor items, and gifts in Hallmark's Nature's Sketchbook by Marjolein Bastin line are among the company's best-selling offerings. Marjolein's work currently is enjoyed the world over. In addition to her partnership with Hallmark, she provides ongoing contributions to Libelle. She also writes and illustrates children's books featuring the endearing Vera the Mouse character, which she created. Through her art and words, Marjolein offers people a simple reminder to pause and enjoy nature and allow it to be a source of serenity, energy, and healing. Finding inspiration in a bird lighting on a branch or a leaf drying in the autumn sun, Marjolein takes long walks each afternoon to seek new ideas for her artwork and her writings. Her workday often begins as early as 6 a.m. and extends into the evening, as she sits at her worktable, which inevitably is crowned with flowers or other finds from the day's walk. Brush in hand, she brings her special relationship with the world full circle: Nature captivates her, and she captures it to share with others. 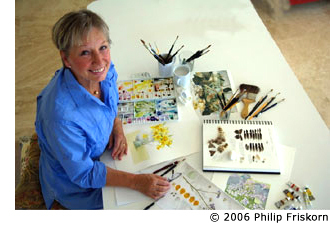 Marjolein's work falls into three main groupings: detailed and exact snapshots of nature (close-ups of what she sees around her); those detailed snapshots that also include Marjolein's personal written observations on nature; and finally, works that show the beauty of nature as touched by human hands, including cut flowers, potted plants, and birdhouses built with pencils.